CTG771. 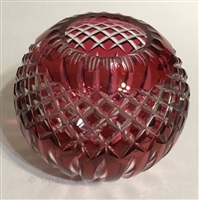 Beautifully cut cranberry overlay rose bowl. Very thick blank with deep cutting and weighs about 2 3/4 pounds. I don't know who the maker is of this bowl, but it emotes the feeling of a master craftsman. 5 1/2" diameter, 5" tall. Excellent condition. PPT763. Pairpoint cut glass ladle with fine cutting and original metal dipper. Signed on metal "Pairpoint Manufacturing Company", Original metal patina, silver-plated. 14 1/2" long. EMP150. 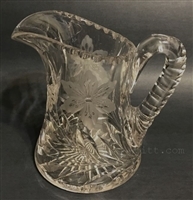 This is a rare piece of cut glass from The Empire Glass Company of Flemington, New Jersey. 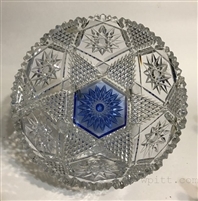 It features a cobalt blue center and is cut in a hobstar pattern. These are hard to find! 9" diameter, 4" tall.